You may be forgiven for thinking this is Unusual Vegetable Week, what with chayote followed by mustard greens, and now cardoons (carduni in Sicilian). It’s simply because autumn is when the market stalls are brimming with the new season’s produce, including quite a few local varieties not found widely outside Sicily. Anyway, back to our cardoons, which look like an untamed, grubby version of celery. Sort of celery with attitude, not least because the edges of the stalks are lined with rather nasty little spikes. They’re probably friendly with passuluna, and you can imagine them going round beating up courgettes. I remember eating them for the first time some years ago in San Fratello, a small town in the Sicilian mountains, where we’d gone for their famous Easter celebrations, which revolve around the Festa dei Giudei, with groups of men dressed up in grotesque red costumes and masks, playing trumpets and drums and in general trying to disrupt the procession of effigies depicting the Madonna and the dead Christ. These “disturbers” are actually part of a time-honoured tradition, dating back to the Middle Ages, and represent the Jews (i giudei), who crucified and whipped Christ. Another time-honoured tradition, although whether it goes back to the Middle Ages or not I don’t know, is for the giudei, at least all the ones I met, to start drinking early, just to make sure they get unruly enough to disrupt celebrations thoroughly (one has to admire their dedication). This became clear as we rolled into town around teatime on Good Friday, and asked a couple of them for directions. Realising that we were tourists, they insisted on a) playing a very loud drunken song for us, b) having their photo taken by us and with us, and c) frogmarching us to one of their houses, where their long-suffering womenfolk, hardly batting an eyelid, began to fuel these complete strangers with copious quantities of wine accompanied by boiled cardoons. They were delicious, just sprinkled with some salt, and made a perfect foil to the rustic local red wine. Within 15 minutes, most of which I predictably spent quizzing the men’s wives/mothers/sisters/daughters about how they prepared the carduni, they had adopted us, and despite our protests, had decreed that we would come back to their house for Easter Sunday lunch. This turned out to be another eye-opening experience, with fifteen or so men and boys packed round a huge dining table, and all the women and girls (except my wife and daughter, who clearly had VIP status) relegated to the kitchen, whence they would emerge at intervals, bringing heavily-laden plates of food. Preheat the oven to 200°C. Cut the lemon in half and squeeze the juice of one half into a basin of cold water. Trim and wash the cardoons and using a knife held against your thumb, strip off any thick filaments from the external ribs. 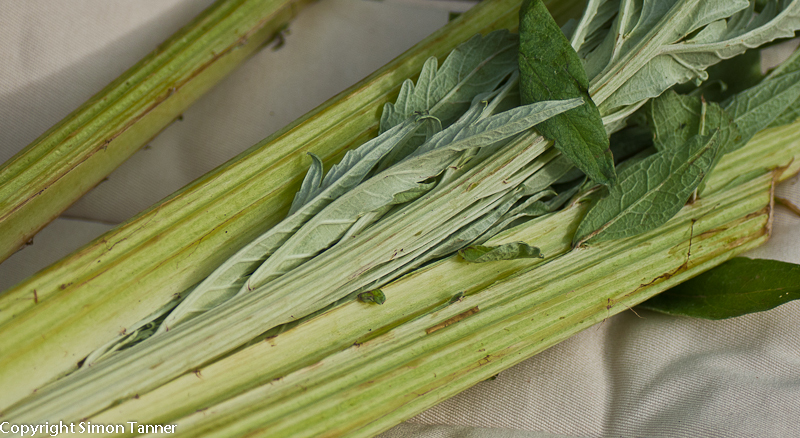 Cut the cardoons into batons as long or short as you like (I usually go for about 8 cm), and transfer them immediately, as each baton is cut, into the lemony water. When finished, leave the cardoons in the water for a further 15 minutes. While the cardoons are soaking, put on a pan of water and bring to the boil. Salt generously and add the juice of the other half of the lemon. Drain the cardoons and place in the pan of boiling water. Cook until tender (this could take anything between 25 and 50 minutes, depending on how old and thick the plant is). Drain well and pat dry. 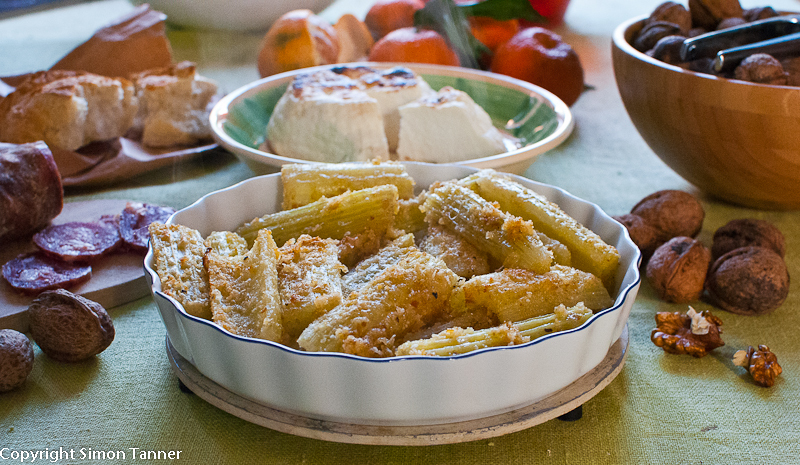 Transfer the cardoons to an oven dish and toss in a tablespoon of oil. Add cheese and breadcrumb mix and toss briefly. Drizzle over some more oil and bake for 20-30 minutes until golden. This entry was posted in Ingredients, Vegetables & side dishes and tagged cardi, cardoon, vegetable by hungryenglishman. Bookmark the permalink. Nice this one. You can actually do a similar thing with wild thistles “cardi”…… Goldfinches love them (raw usually)……. hence the term “cardellini”. Eat a chunk of fennel before drinking the wine. Big Nige.